This post describes changes on the Public Test Realm. In this update we'd like to introduce the results of what our frontend team (designer Roman and developer Dmitriy) has been doing during last two months. We have revamped the entire visual style of the game, and today we're starting to deploy it gradually to various parts of the game UI. First of all, Screeps will have new logo soon! It is much more visually clear, sends more obvious message of coding, and has "creeps" part highlighted and animated. Fun! A note for those interested in technologies behind the scene: we're migrating from AngularJS to modern Angular on these UIs. Now to changes in functionality. Subscription Tokens market is now global and works between shards. You can buy and sell tokens from/to any shard, all orders are visible on all shards. Due to this, created property in the order is now meaningless for tokens (since it is in ticks), and new createdTimestamp property has been added. As it is shown on the first screenshot, the Steam login page now has option to choose one of the predefined Community servers to connect. 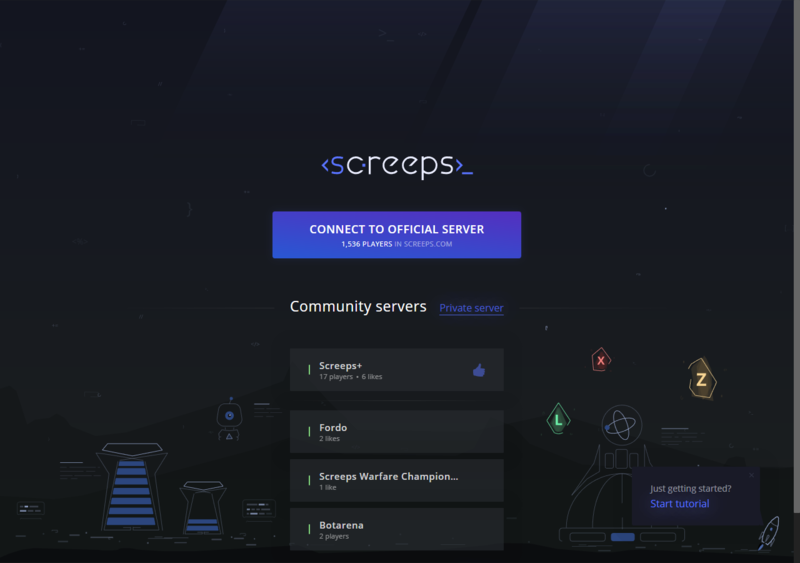 If you want your server to be added to this list, please send a email to contact@screeps.com. What do you think about this new design?